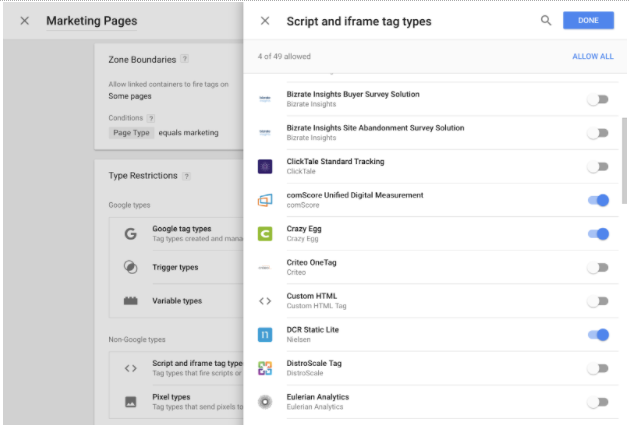 Whether you’re a small business with a single site or a large enterprise with many complex sites and apps, Google Tag Manager makes it easier to implement and maintain the tags for all your marketing and measurement tools. Over the past few years, we've continued to improve the core functionality of Tag Manager for all users while also introducing enterprise features for customers with more advanced needs. For Tag Manager 360 customers, we recently added Approvals functionality, enabling enterprise users to involve more stakeholders in the tagging process without needing to give them full Publish access. Submit Changes screen in Tag Manager 360 showing how users with Edit access can request approval. Using Approvals, you can limit select users to requesting approval for tagging changes. Then you can use the built-in commenting capability to work back and forth with them to get things just right. Today we’re excited to announce another new feature that gives you even more control over your tagging: Zones for Tag Manager 360! 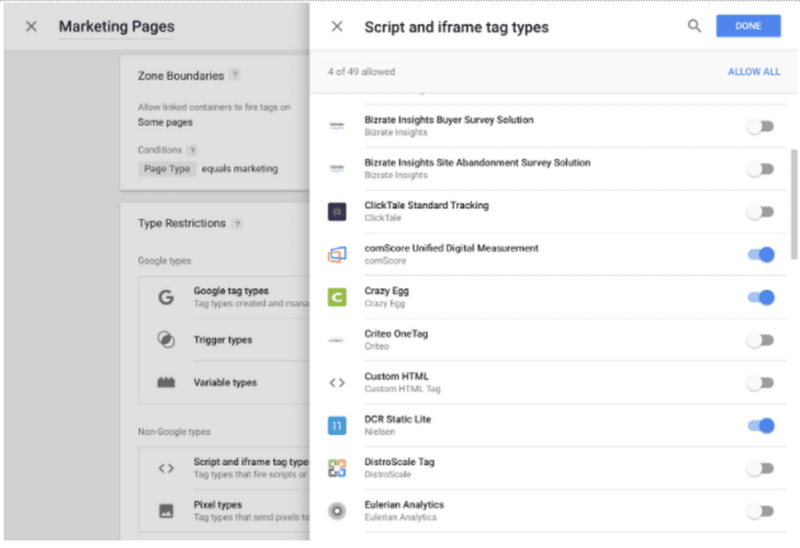 With Zones, you can give users access to publish certain types of tags on certain parts of your site. Zones work by letting you link additional containers within specified page boundaries. 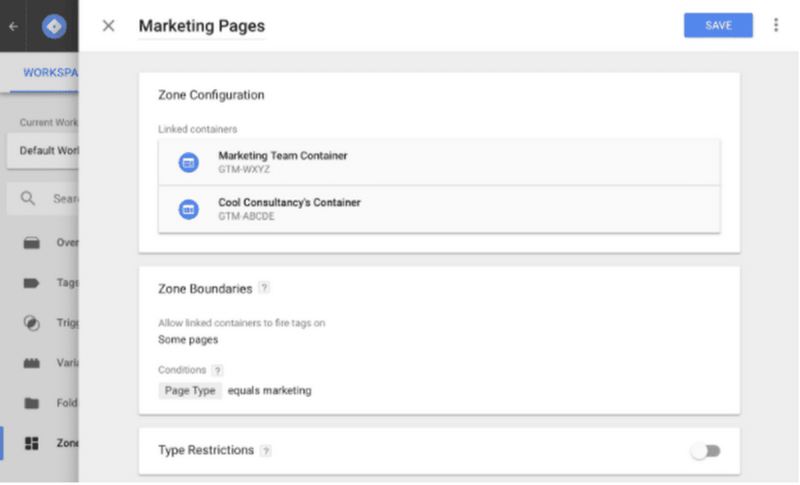 Zone configuration screen in Tag Manager 360 highlighting the steps of linking containers, defining zone boundaries, and optionally turning on type restrictions. When a page loads within the zone boundaries, any containers linked within the zone will load alongside your main container. For example, you could give your marketing team and agencies Publish access to their own containers, but limit them to only your marketing pages. This gives them the flexibility to manage their tagging independently and reduces work for admins and developers. For even more control, you can turn on Type Restrictions to choose what types of tags, triggers, and variables will work from containers within a zone. Type Restrictions for a Zone in Tag Manager 360 highlighting how individual tag types can be allowed or restricted. So, whether you’re making a few quick updates to who can publish which tags or building a comprehensive tagging plan for a network of global, regional, and local websites, Zones gives you more power and flexibility to set up the right tagging workflows for your organization. If you’re already a Tag Manager 360 customer, you’ll see a new Zones section in the left sidebar of your containers starting today. Visit our help center to learn more about Zones. , you can reach out to your Account Manager. If you’re brand new to the Analytics 360 Suite, visit our website to learn more.